Dipyridamole potentiates the action of adenosine, requiring the use of lower doses. Caffeine's principal mode of action is as an antagonist of adenosine receptors in the brain. 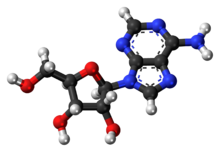 Methylxanthines (e.g., caffeine, found in coffee, or theophylline in tea, or theobromine, as found in chocolate) competitively antagonize adenosine's effects; an increased dose of adenosine may be required. By nature of caffeine's purine structure, it binds to some of the same receptors as adenosine. The pharmacological effects of adenosine may be blunted in individuals taking large quantities of methylxanthines. When administered via a central lumen catheter, adenosine has been shown to initiate atrial fibrillation because of its effect on atrial tissue. In individuals with accessory pathways, the onset of atrial fibrillation can lead to a life-threatening ventricular fibrillation. However, adenosine may be administered if equipment for cardioversion is immediately available as a backup. Many individuals experience facial flushing, a temporary rash on the chest, lightheadedness, diaphoresis, or nausea after administration of adenosine due to its vasodilatory effects. Metallic taste is a hallmark side-effect of adenosine administration. These symptoms are transitory, usually lasting less than one minute. It is classically associated with a sense of "impending doom", more prosaically described as apprehension. This lasts a few seconds after administration of a bolus dose, during transient asystole induced by intravenous administration. In some cases, adenosine can make patients' limbs feel numb for about 2–5 minutes after administration intravenously depending on the dosage (usually above 12 mg). Adenosine is an endogenous purine nucleoside that modulates many physiological processes. Cellular signaling by adenosine occurs through four known adenosine receptor subtypes (A1, A2A, A2B, and A3). Extracellular adenosine concentrations from normal cells are approximately 300 nM; however, in response to cellular damage (e.g. in inflammatory or ischemic tissue), these concentrations are quickly elevated (600–1,200 nM). Thus, in regard to stress or injury, the function of adenosine is primarily that of cytoprotection preventing tissue damage during instances of hypoxia, ischemia, and seizure activity. Activation of A2A receptors produces a constellation of responses that in general can be classified as anti-inflammatory. All adenosine receptor subtypes (A1, A2A, A2B, and A3) are G-protein-coupled receptors. The four receptor subtypes are further classified based on their ability to either stimulate or inhibit adenylate cyclase activity. The A1 receptors couple to Gi/o and decreases cAMP levels, while the A2 adenosine receptors couple to Gs, which stimulates adenylate cyclase activity. In addition, A1 receptors couple to Go, which has been reported to mediate adenosine inhibition of Ca2+ conductance, whereas A2B and A3 receptors also couple to Gq and stimulate phospholipase activity. Researchers at Cornell University have recently shown adenosine receptors to be key in opening the blood-brain barrier (BBB). Mice dosed with adenosine have shown increased transport across the BBB of amyloid plaque antibodies and prodrugs associated with Parkinson's disease, Alzheimer's, multiple sclerosis, and cancers of the central nervous system. Adenosine is an endogenous agonist of the ghrelin/growth hormone secretagogue receptor. However, while it is able to increase appetite, unlike other agonists of this receptor, adenosine is unable to induce the secretion of growth hormone and increase its plasma levels. When it is administered intravenously, adenosine causes transient heart block in the atrioventricular (AV) node. This is mediated via the A1 receptor, inhibiting adenylyl cyclase, reducing cAMP and so causing cell hyperpolarization by increasing K+ efflux via inward rectifier K+ channels, subsequently inhibiting Ca2+ current. It also causes endothelial-dependent relaxation of smooth muscle as is found inside the artery walls. This causes dilation of the "normal" segments of arteries, i.e. where the endothelium is not separated from the tunica media by atherosclerotic plaque. This feature allows physicians to use adenosine to test for blockages in the coronary arteries, by exaggerating the difference between the normal and abnormal segments. The administration of adenosine also reduces blood flow to coronary arteries past the occlusion. Other coronary arteries dilate when adenosine is administered while the segment past the occlusion is already maximally dilated, which is a process called coronary steal. This leads to less blood reaching the ischemic tissue, which in turn produces the characteristic chest pain. Adenosine used as a second messenger can be the result of de novo purine biosynthesis via adenosine monophosphate (AMP), though it is possible other pathways exist. When adenosine enters the circulation, it is broken down by adenosine deaminase, which is present in red cells and the vessel wall. Dipyridamole, an inhibitor of adenosine nucleoside transporter, allows adenosine to accumulate in the blood stream. This causes an increase in coronary vasodilatation. Adenosine deaminase deficiency is a known cause of immunodeficiency. The adenosine analog NITD008 has been reported to directly inhibit the recombinant RNA-dependent RNA polymerase of the dengue virus by terminating its RNA chain synthesis. This suppresses peak viremia and rise in cytokines and prevented lethality in infected animals, raising the possibility of a new treatment for this flavivirus. The 7-deaza-adenosine analog has been shown to inhibit the replication of the hepatitis C virus. BCX4430 is protective against Ebola and Marburg viruses. Such adenosine analogs are potentially clinically useful since they can be taken orally. Adenosine is believed to be an anti-inflammatory agent at the A2A receptor. Topical treatment of adenosine to foot wounds in diabetes mellitus has been shown in lab animals to drastically increase tissue repair and reconstruction. Topical administration of adenosine for use in wound-healing deficiencies and diabetes mellitus in humans is currently under clinical investigation. Methotrexate's anti-inflammatory effect may be due to its stimulation of adenosine release. In general, adenosine has an inhibitory effect in the central nervous system (CNS). Caffeine's stimulatory effects are credited primarily (although not entirely) to its capacity to block adenosine receptors, thereby reducing the inhibitory tonus of adenosine in the CNS. This reduction in adenosine activity leads to increased activity of the neurotransmitters dopamine and glutamate. Experimental evidence suggests that adenosine and adenosine agonists can activate Trk receptor phosphorylation through a mechanism that requires the adenosine A2A receptor. Adenosine has been shown to promote thickening of hair on people with thinning hair. A 2013 study compared topical adenosine with minoxidil in male androgenetic alopecia, finding it was not superior to minoxidil and further trials were needed. The principal component of marijuana, delta-9-tetrahydrocannabinol (THC) and the endocannabinoid anandamide (AEA) induce sleep in rats by increasing adenosine levels in the basal forebrain. They also significantly increase slow-wave sleep during the third hour, mediated by CB1 receptor activation. These findings identify a potential therapeutic use of cannabinoids to induce sleep in conditions where sleep may be severely attenuated. ^ a b c d "Adenosine". The American Society of Health-System Pharmacists. Retrieved Jan 12, 2015. ^ I.K. Morton; Judith M. Hall (6 December 2012). Concise Dictionary of Pharmacological Agents: Properties and Synonyms. Springer Science & Business Media. pp. 106–. ISBN 978-94-011-4439-1. ^ J. Buckingham (1987). Dictionary of Organic Compounds. CRC Press. pp. 75–. ISBN 978-0-412-54090-5. ^ Index Nominum 2000: International Drug Directory. Taylor & Francis. January 2000. pp. 18–. ISBN 978-3-88763-075-1. ^ Sato, A (April 2005). "Mechanism of vasodilation to adenosine in coronary arterioles from patients with heart disease". American Journal of Physiology. Heart and Circulatory Physiology. 288 (4): H1633–40. doi:10.1152/ajpheart.00575.2004. PMID 15772334. ^ Costa, F; Biaggioni, I (May 1998). "Role of nitric oxide in adenosine-induced vasodilation in humans". Hypertension. 31 (5): 1061–4. doi:10.1161/01.HYP.31.5.1061. PMID 9576114. ^ Morgan, JM; McCormack, DG; Griffiths, MJ; Morgan, CJ; Barnes, PJ; Evans, TW (September 1991). "Adenosine as a vasodilator in primary pulmonary hypertension". Circulation. 84 (3): 1145–9. doi:10.1161/01.CIR.84.3.1145. PMID 1884445. ^ Mitchell J, Lazarenko G (November 2008). "Wide QRS complex tachycardia. Diagnosis: Supraventricular tachycardia with aberrant conduction; intravenous (IV) adenosine". CJEM. 10 (6): 572–3, 581. PMID 19000353. ^ Pijls, Nico H. J.; Bernard De Bruyne (2000). Coronary Pressure. Springer. ISBN 0-7923-6170-9. ^ O'Keefe, JH; Bateman, TM; Silverstri, R; et al. (1992). "Safety and diagnostic accuracy of adenosine thallium-201 scintigraphy in patients unable to exercise and those with left bundle branch block". Am. Heart J. 124 (3): 614–21. doi:10.1016/0002-8703(92)90268-z. PMID 1514488. ^ a b "Caffeine". Chemistry Explained. ^ "Vitamin B4". R&S Pharmchem. April 2011. Archived from the original on 2011-07-15. ^ Brown RA, Spina D, Page CP (March 2008). "Adenosine receptors and asthma". Br. J. Pharmacol. 153 Suppl 1 (S1): S446–56. doi:10.1038/bjp.2008.22. PMC 2268070. PMID 18311158. ^ Haskó G, Linden J, Cronstein B, Pacher P (September 2008). "Adenosine receptors: therapeutic aspects for inflammatory and immune diseases". Nat Rev Drug Discov. 7 (9): 759–70. doi:10.1038/nrd2638. PMC 2568887. PMID 18758473. ^ Haskó, G (January 2004). "Adenosine: an endogenous regulator of innate immunity". Trends in Immunology. 25 (1): 33–39. doi:10.1016/j.it.2003.11.003. PMID 14698282. ^ Carman, A. J.; Mills, J. H.; Krenz, A; Kim, D. G.; Bynoe, M. S. (2011). "Adenosine receptor signaling modulates permeability of the blood-brain barrier". J. Neurosci. 31 (37): 13272–80. doi:10.1523/JNEUROSCI.3337-11.2011. PMC 3328085. PMID 21917810. ^ a b Claude Kordon; I. Robinson; Jacques Hanoune; R. Dantzer (6 December 2012). Brain Somatic Cross-Talk and the Central Control of Metabolism. Springer Science & Business Media. pp. 42–. ISBN 978-3-642-18999-9. ^ Katzung, Bertram (2012). Basic & Clinical Pharmacology (12th ed.). McGraw Hill. p. 245. ISBN 978-0-07-176402-5. ^ Miller-Patrick K, Vincent DL, Early RJ, et al. (1993). "Effects of the purine biosynthesis pathway inhibitors azaserine, hadacidin, and mycophenolic acid on the developing ovine corpus luteum". Chin J Physiol. 36 (4): 245–52. PMID 8020339. ^ Yin, Z; Chen, YL; Schul, W; Wang, QY; Gu, F; Duraiswamy, J; Reddy Kondreddi, R; Niyomrattanakit, P; Lakshminarayana, SB; Goh, A; Xu, HY; Liu, W; Liu, B; Lim, JY; Ng, CY; Qing, M; Lim, CC; Yip, A; Wang, G; Chan, WL; Tan, HP; Lin, K; Zhang, B; Zou, G; Bernard, KA; Garrett, C; Beltz, K; Dong, M; Weaver, M; He, H; Pichota, A; Dartois, V; Keller, TH; Shi, PY (2009). "An adenosine nucleoside inhibitor of dengue virus". Proc Natl Acad Sci U S A. 106 (48): 20435–20439. Bibcode:2009PNAS..10620435Y. doi:10.1073/pnas.0907010106. PMC 2787148. PMID 19918064. ^ Olsen, DB; Eldrup, AB; Bartholomew, L; Bhat, B; Bosserman, MR; Ceccacci, A; Colwell, LF; Fay, JF; Flores, OA; Getty, K. L.; Grobler, J. A.; Lafemina, R. L.; Markel, E. J.; Migliaccio, G.; Prhavc, M.; Stahlhut, M. W.; Tomassini, J. E.; MacCoss, M.; Hazuda, D. J.; Carroll, S. S. (2004). "A 7-Deaza-Adenosine Analog Is a Potent and Selective Inhibitor of Hepatitis C Virus Replication with Excellent Pharmacokinetic Properties". Antimicrobial Agents and Chemotherapy. 48 (10): 3944–53. doi:10.1128/AAC.48.10.3944-3953.2004. PMC 521892. PMID 15388457. ^ Warren, T. K.; Wells, J.; Panchal, R. G.; Stuthman, K. S.; Garza, N. L.; Van Tongeren, S. A.; Dong, L.; Retterer, C. J.; Eaton, B. P.; Pegoraro, G.; Honnold, S.; Bantia, S.; Kotian, P.; Chen, X.; Taubenheim, B. R.; Welch, L. S.; Minning, D. M.; Babu, Y. S.; Sheridan, W. P.; Bavari, S. (2014). "Protection against filovirus diseases by a novel broad-spectrum nucleoside analogue BCX4430". Nature. 508 (7496): 402–5. Bibcode:2014Natur.508..402W. doi:10.1038/nature13027. PMID 24590073. ^ Nakav S, Chaimovitz C, Sufaro Y (2008). Bozza P (ed.). "Anti-Inflammatory Preconditioning by Agonists of Adenosine A1 Receptor". PLoS ONE. 3 (5): e2107. Bibcode:2008PLoSO...3.2107N. doi:10.1371/journal.pone.0002107. PMC 2329854. PMID 18461129. ^ Trevethick MA, Mantell SJ, Stuart EF, Barnard A, Wright KN, Yeadon M (October 2008). "Treating lung inflammation with agonists of the adenosine A2A receptor: promises, problems and potential solutions". Br. J. Pharmacol. 155 (4): 463–74. doi:10.1038/bjp.2008.329. PMC 2579671. PMID 18846036. ^ Cronstein B (2010). "How does methotrexate suppress inflammation?". Clin Exp Rheumatol. 28 (5 Suppl 61): S21–3. PMID 21044428. ^ Solinas, M; Ferré, S; You, Z. B; Karcz-Kubicha, M; Popoli, P; Goldberg, S. R (2002). "Caffeine induces dopamine and glutamate release in the shell of the nucleus accumbens". The Journal of Neuroscience. 22 (15): 6321–4. PMID 12151508. ^ Lee, FS; Chao, MV; Lee (March 2001). "Activation of Trk neurotrophin receptors in the absence of neurotrophins". PNAS. 98 (6): 3555–3560. Bibcode:2001PNAS...98.3555L. doi:10.1073/pnas.061020198. PMC 30691. PMID 11248116. ^ Oura, H; Iino, M; Nakazawa, Y; Tajima, M; Ideta, R; Nakaya, Y; Arase, S; Kishimoto, J (December 2008). "Adenosine increases anagen hair growth and thick hairs in Japanese women with female pattern hair loss: a pilot, double-blind, randomized, placebo-controlled trial". The Journal of dermatology. 35 (12): 763–7. doi:10.1111/j.1346-8138.2008.00564.x. PMID 19239555. ^ Hwang, KA; Hwang, YL; Lee, MH; Kim, NR; Roh, SS; Lee, Y; Kim, CD; Lee, JH; Choi, KC (February 2012). "Adenosine stimulates growth of dermal papilla and lengthens the anagen phase by increasing the cysteine level via fibroblast growth factors 2 and 7 in an organ culture of mouse vibrissae hair follicles". International Journal of Molecular Medicine. 29 (2): 195–201. doi:10.3892/ijmm.2011.817. PMID 22020741. ^ Faghihi, G; Iraji, F; Rajaee Harandi, M; Nilforoushzadeh, M. A.; Askari, G (2013). "Comparison of the efficacy of topical minoxidil 5% and adenosine 0.75% solutions on male androgenetic alopecia and measuring patient satisfaction rate". Acta Dermatovenerol Croat. 21 (3): 155–9. PMID 24183218. ^ Murillo-Rodriguez, Eric; Blanco-Centurion, Carlos; Sanchez, Cristina; Daniele, Piomelli; Shiromani, Priyattam J. (2003). "Anandamide Enhances Extracellular Levels of Adenosine and Induces Sleep: An In Vivo Microdialysis Study". Sleep. 26 (8): 943–947. doi:10.1093/sleep/26.8.943. ISSN 0161-8105.